The Panchayats were in existence from 1960s. But they received constitutional status by the 73rd constitutional amendment act of 1992. It was created by respective state legislature acts so as to function democracy from grass root level, so it’s the prime necessity of democracy to develop rural areas. Rajasthan was the first state to establish Panchayti Raj. It was inaugurated by the Prime Minister on October 2, 1959 in Nagaur district. Second state to establish Panchayati Raj was Andhra Pradesh. (1959). The panchayat between village and district level who’s population is more than 20 lakhs. 1. Balwant Rai Mehta Committee January 1957 Recommended the establishment of the scheme of democratic decentralization which ultimately came to known as Panchayati Raj. 2. Ashok Mehta Committee December 1977 Two tier system of Panchayati Raj instead of three tier system of Panchayati Raj.It should consist of zila parishad at the district level & mandal panchayat consisting of a group of villages with total population of 15,000 to 20,000. 3. GVK Rao Committee 1985 Came out with the finding that developmental process was gradually bureaucratized and divorced form the Panchayati Raj. 4. L M Singhvi Committee 1986 Panchayats should be given constitutional status. All the members of panchayat are elected by peoples directly. Chairpersons of the panchayats at the intermediate and district levels shall be elected indirectly – by and from amongst the elected members therof. Chairperson of a panchayat at the village level shall be elected in such a manner as the state legislature determines. 1/3rd seats are reserved for women including the number of seats reserved for women belonging to ST and STs. The reservation for SC and NTs is according to the popullaton in that area. Note: Also, a state has been given power to reserve seats in any panchayat or offices of chairperson in the panchayat at any level for backward classes. The state can provide reservation for the office of chairperson in panchayat or the village and other level in fervor of backward class. Elections of panchayats are carried out by state election commission. The state election commissioner is appointed by governor of the concerned state. It can be dissolved before expiry of its term. (fresh elections in such a case should be held before the expiry of six months from the date of its dissolution. All the powers & functions of panchayats are made by respective state governments. The state legislature (may) gives power to the panchayts to collect, levy the appropriate tax duties. Governor constitutes a finance commission (after every 5 years), to review the financial position of the panachayats. Committee gives the following recommendation to the governor. Tax distribution between state and the panchayats. Check the duties, taxes, tolls and fees which are assigned to the panchayats. Determine the grant in aids to the panchayats. Determine the things needed to improve the finance of the panchayats. 2. Social welfare, including welfare of the handicapped, and mentally retarded. 8. Rural electrification, including distribuation of electricity. 11. Small scale industries, including food producing industries. 12. Social forestry and farm forestry. 13. Animal husbandry, dairying, and poultry. 14. Land improvement, implementation of land reforms, land consolidation and soil conservation. 16. Welfare of the weaker sections, and in particular, of the scheduled castes and the scheduled tribes. 17. Women and child development. 18. Health and sanitation including hospitals, primary health centers and dispensaries. 22. Non convention energy sources. 28. Minor irrigation , water management, and watershade development. Agriculture including agricultural extension. Under the article 329, courts have no jurisdiction to find the validity of law, relating to the allotment of seats, delimitation of constituencies, etc. Court can’t question those matters related to election in panchayats. This amendment act gave constitutional status to panchayat raj institutions. Previously, creation of panchayats & its elections depended on the will of state government. Now, this amendment act had put an obligation on the state government about creation & the related elections. Added Part IX to constitution. Added eleventh schedule to constitution which has 29 functional items of the panchayats. This amendment act gave effect to article 40 of the constitution which is actually in the directive principles. It states that state shall take steps to organize village panchayats and endow them with such powers and authority as may be necessary to enable them to function as units of selfgovernment. a. Constitute a state finance commission every five years. c. Reservation of seats for SCs & STs in panchayats at the three levels. d. Indirect elections to the post of chairperson of panchayats at the intermediate and district levels. e. Establishment of panchayats at the village, intermediate and district levels. 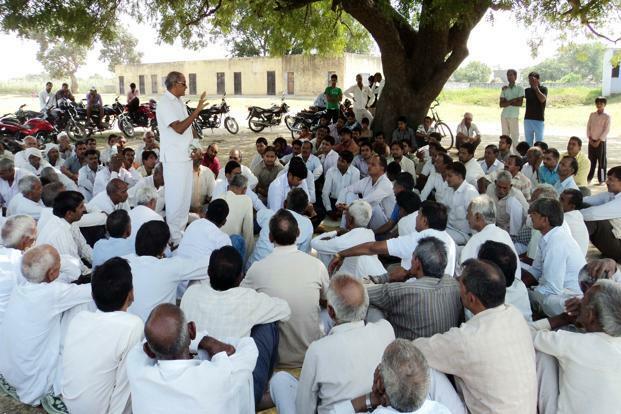 f. Organisation of Gram sabha in a village or group of villages. g. Direct elections to all seats in panchayats. h. 21 years to be the minimum age for contesting elections to panchayats. j. Establishment of a state election commission for conducting elections to the panchayats. c. Giving representation to members of the Parliament (both the Houses) and the state legislature (both the houses) in the panchayats at different levels falling within their constituencies. d. Devolution of powers and responsibilities upon panchayats to prepare plans for economic development and social justice. e. Providing reservation of seats for backward classes in the state at any level. Gram sabha is a basic foundation of panchayats. Members of gram sabha include all the people in the area registered in the voter list. Functions of gram sabha differ from state to state i.e. the functions of the gram sabha are decided by the concerned state legislature. who is the Ex-Officio Chairman of Planning Commission?